LEON PANETTA: No. No, not at all. We - you know, we had some observation of the approach there, but we did not have direct flow of information as to the actual conduct of the operation itself as they were going through the compound. 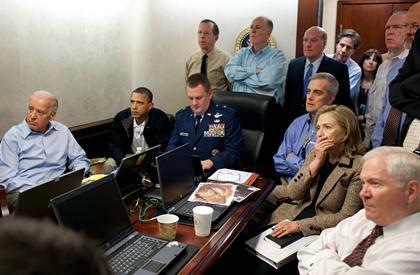 JIM LEHRER: What about at the White House situation room where President Obama was? Did he have any - was he seeing anything, any actual time, real-time action going on as well? LEON PANETTA: I think they were viewing some of the real-time aspects of this as well in terms of the intelligence that we were getting. JIM LEHRER: So do you think the - did the president see the shots fired at Osama bin Laden? LEON PANETTA: No. No, not at all. I think we - you know, we saw from, you know, some of the operations that we knew that the helicopters had - were on the ground, that the teams were going into the compound. And that was the kind of information that we were following. Panetta said that had bin Laden "thrown up his hands, surrendered and didn't appear to be representing any kind of threat," he would have been captured alive. He said he is not aware of any communication between bin Laden and the SEALs, but the CIA is still getting "feedback" on what happened.